Godzilla vs. Aliens. Who wins? One has atomic laser breath, huge size, and thick armored skin. The other has acidic saliva and a penchant for impregnating any living thing with its progeny. Can you imagine a Godzilla Xenomorph? Get Hollywood on the line, stat! Obviously, part of this fight has to depend on numbers. 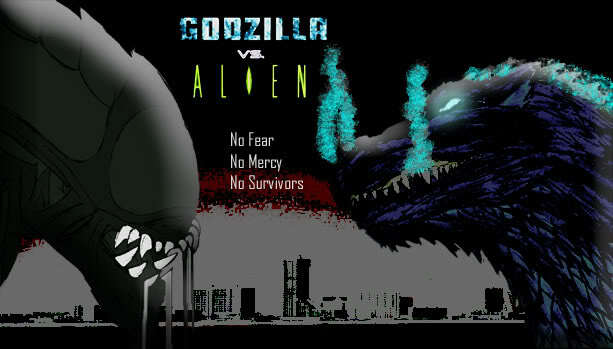 If it's one alien versus Godzilla, then the alien loses. If we're talking a host of aliens swarming through the city then it might be more dicey. Since their saliva can cut through the most advanced metals future humanity has devised, I wouldn't be surprised if it also could harm Godzilla. On the other hand, atomic laser breath. So which is it, HeroMachine Nation? Who would win an epic battle between these two horror movie staples? 41 Responses to Godzilla vs. Aliens. Who wins? One on one, I’d say Godzilla. If there were a swarm, the aliens. Even if it just starts with a dozen or so in a populated area and turns a bunch of the locals, or even in the wilderness with alien animals, Godzilla’s gonna hava a tough time. I mean, can you imagine an army of Alien/honey badger hybrids? At that point, Godzilla’s screwed. Right after that, the Earth dies. I don’t know, if you’re talking about a species whose best weapon against Godzilla is that if they get crushed underfoot, their acid blood is going to cause some pain after a while, then the Xenomorphs have nothing. Godzilla meanwhile can incinerate them with the fiery breath of a nuclear reactor, and even topple entire buildings on them. Nope, gonna give it to the big guy. I don’t know, if you’re talking about a species whose best weapon against Godzilla is that if they get crushed underfoot, their acid blood is going to cause some pain after a while, then the Xenomorphs have nothing.Godzilla meanwhile can incinerate them with the fiery breath of a nuclear reactor, and even topple entire buildings on them.Nope, gonna give it to the big guy. You clearly missed the part where i mentioned that 1-on-1 does absolutely jack. Getting crushed underfoot, I also give it to Godzilla, but a bunch of aliens making millions (if not billions or trillions) of hybrids and then marching to take on Godzilla is another story entirely. Imagine Godzilla getting pushed into the ocean by a bunch of alien/elephant hybrids, and any other kind of hybrid that there could possibly be and then once in the ocean getting eaten by a million alien/shark hybrids or a dozen alien/blue whale or killer whale hybrids. That’s not even considering all the stuff that lives at the bottom of the ocean we don’t even know about. In other words, the aliens by themselves are not even Godzilla’s biggest threat. The biggest problem lies in the aliens’ ability to create hybrids. With a planet full of things ready to attack, Godzilla is screwed. The aliens would only have to get a single egg into Godzilla’s mouth, then it’s all over. And the Aliens are smart, they’ve adapted strategies before, I wouldn’t put it past them to glue an egg to their back, and crawl up and sneak in. The big lizard might not even notice something that small until it was far too late. Then you’ve got Meg-Alien…probably with radioactive breath lasers. Nice. godzilla could just step on the xenomorph . he is like 50 feet tall and has been nuked and survived. Alas, I haven’t seen either movie (I don’t know about Godzilla movies, but Alien’s an 18 film, so I’ve got another three years), so I’ll probably go with the majority on this one. Can someone tell me which one’s got the most votes? I “survived” a brown recluse. That’s what Alien would be to Godzilla. An annoying under-the-shoulder fry-off. Nasty, sick, bulbous green spots. Scary enough yet sickly sad… easily removed. What an annoyance. The interesting battle would be between the hybrid that birthed itself out of Godzilla and Godzilla. It would be a gruesome battle, as thousands or even millions of aliens swarmed over the indestructible beast, and inevitably one would get an egg inside him, but that would not kill Godzilla. In this case, Godzilla takes on the role of hero, and would thus win. Especially since Godzilla has already survived being disintegrated in his very first appearance, as well as having been nuked, buried in an active volcano, frozen solid multiple times, and shot into space. Wait, seriously? Godzilla has survived a nuclear bomb. The xenos stand precisely ZERO chance against him. Even if a thousand of them all swarmed Godzilla at once, climbed all over him and ripped open their own chests to cover him with their acid blood, he shrugged off a nuclear bomb. Anything that can do that will not be bothered by a little acid. Hell, Godzilla would probably thank them. All that acid must be a great exfoliant. Okay then, spray a cockroach with acid some time and see how that works out. Same basic principle. Godzilla has defeated half a dozen alien races and dozens of monsters his own size. The xenomorphs have been defeated by children, rock-climbers and hick cops. Get serious. First the obvious question: Could the Xenomorphs impregnate Godzilla, thus having a huge Godzilla-Alien-Hybrid bursting out of his chest? It doesn’t seem likely, because the face-huggers could never fit on Godzilla’s face. Of course, the Japanese Behemoth could swallow one whole. Hell, he could swallow dozens of facehuggers whole and become a breeding ground for hundreds of Xenomorphs. The question remains, if the embryos could actually grow in Godzilla. Remember, the Aliens may have acid blood, but Big G has poisonous radioactive blood. Gojira isn’t “just” a fire-breathing Lizard as big as the Empire-State Building, he is basically a walking nuclear reactor. I doubt that any parasitic infection could survive in him. Next question: Could the Aliens defeat Godzilla? Clearly, only a swarm of milions of Aliens would have a snowballs chance in hell of killing Godzilla. Many of you have sided with the Aliens, stating it would be like ants killing a grown man. Normally, I would agree with you. Several smaller creatures can together kill a larger organism. But Godzilla could prove to be the exception. He is gigantic, has got an impregnable hide, regenerative abilities, a devastating radioactive breath and a deadly aura. Plus, as I have mentioned above, it wouldn’t be an army of Xenomorphs attacking a walking mountain, but rather an army of Xenomorphs attacking a walking nuclear power plant. Remember, in the movie “Aliens”, the sequel to “Alien” the whole Alien-colony gets destroyed in end, when the reactor of the processing plant goes up like a thermonuclear weapon. And Godzilla is a living thermonuclear weapon. So I think I will vote for Godzilla. Hold on a second. First off, some of this discussion has taken on a disturbingly abusive tone, of which this blog has always been relatively free. Let’s keep it civil. Second, I apparently missed the part where it became gospel that the spawn of an Alien took on the attributes of the host. But then, I pretty much stopped paying attention after Cameron’s “Aliens” so I suppose it’s possible. If it is, then yes, with a great deal of forethought and a careful breeding program, the Aliens could develop the ability to overrun and defeat Godzilla whenever he might decide to show up. But even if that’s the case, it seems to me that an Alien getting an egg into Godzilla would be like an insect egg inside a human – perhaps some gastric discomfort until the egg is eliminated. He’s tough enough on the outside to resist a nuke, he’s probably tough enough on the inside to thwart a lil’ chestburster’s best efforts to get out. Hyperanthropos stated the case better while I was previewing my .02 worth. Oh, McKnight. You just made my night. I’d have to go with the aliens, though. Eventually the acid blood of even a single alien smooshed underfoot would cause an infection, ergo, Godzilla dies of a cold. No clue what Reptar is, but my money’s already on it to turn that purple torture device that’s clearly been outlawed by the Geneva Convetion into a purple smear. It’s been mentioned in several of the comics and books that the Alien parasite takes on genetic materiel from it’s host, and using it to build hte basis of it’s body. And it was pretty much confirmed in the last AvP movie, where the alien came out of the predator – the ‘Predalien’. And I don’t think the face hugger would have to actually hug Godzilla’s face, but if one of the little buggers could get inside, and plant the egg, it would start taking on the genetic materiel of the big lizard and soon you’d have a giant chest burster. Killing Godzilla and making the biggest Alien ever….probably with atomic breath coming out of it’s multi jawed mouth thingy. knight1192a: No clue what Reptar is, but my money’s already on it to turn that purple torture device that’s clearly been outlawed by the Geneva Convetion into a purple smear. Reptar is basically the toy version of Godzilla from Rugrats. McKnight57: Okay then, spray a cockroach with acid some time and see how that works out. Same basic principle. I didn’t say radiation, I said nuclear bomb. Godzilla survived a nuclear explosion. Nothing that can shrug off a nuclear explosion is going to be troubled by a few tiny aliens. Doornik1142: I didn’t say radiation, I said nuclear bomb. Godzilla survived a nuclear explosion. Nothing that can shrug off a nuclear explosion is going to be troubled by a few tiny aliens. Okay…but eventually Keith Richards will die of drug overdose and Twinkies will mold too, but it ain’t happened yet. McKnight57: Imagine Godzilla getting pushed into the ocean by a bunch of alien/elephant hybrids, and any other kind of hybrid that there could possibly be and then once in the ocean getting eaten by a million alien/shark hybrids or a dozen alien/blue whale or killer whale hybrids. That’s not even considering all the stuff that lives at the bottom of the ocean we don’t even know about. You do realize that Godzilla is what lurks at the bottom of the sea, right? He’s not scared of a shark or a whale, that’s his before breakfast snack. He also has home-turf advantage in water, as well as increased speed and maneuverability. They would be better off keeping him on land. McKnight57: Okay…but eventually Keith Richards will die of drug overdose and Twinkies will mold too, but it ain’t happened yet. Thanks for setting me straight, Gene. I still kind of suspect that Godzilla’s gigantic nuclear immune system would fry any egg that got implanted before any genetic transmogrification took place, but admittedly that’s a guess. As is all of this of course. We can’t hope to settle the question, and if we did it would be less fun than arguing about it. I would like to see an artist’s conception of the Godzalien. By the way, I used to work in a TV repair shop, and occasionally a TV would come in that was chock full o roaches (they liked the warmth). We’d plastic-bag the whole thing and hose it with insecticide. Anyway, we tried putting a cockroach in the microwave. About 10 minutes as I recall. Little sucker strolled out with a nice tan. HEY! Godzilla freq. has the mystical connection to protect the Earth, so would any Godzillamorph Aliens automatically take Godzilla’s side? Okay, gonna have to go with the Aliens. I mean, yes, Godzilla has the size and fiery breath but are we forgetting that if the Aliens infect you, the offspring turns out to be a combination of the host and the Alien? I’m imagining a Godzilla-like Alien that has acid blood. Don’t think Godzilla could live through that. On the other hand, if it is just a one-on-one fight, then Godzilla would win for sure. But if there’s even a couple of hours time, Aliens could infect Godzilla. Just sayin’. Maybe so, but microwave radiation and the ionizing radiation produced by a nuclear explosion are two very different things. Microwaves are at the low end of the spectrum, between infrared and radio waves. Ionizing radiation ranges from the extreme ultraviolet range up into x-rays and gamma rays. Also, radiation is not the main issue with a nuclear weapon. The main issue is the tremendous heat and shockwave generated by the explosion. If Godzilla can survive that, no puny xenomorph is going to touch him. Look at the voter: It says “Aliens.” Emphasis on the “S”. this means that there are multiple and Godzilla is screwed. Besides, the Xenomorphs are badass. Godzilla will and will keep destroying no wait pulverising any othe appounets. 2) If nuclear weapons and other projectile weaponry couldn’t penetrate Godzilla’s hide, what chance does an Alien mini-me mouth have at getting through? 3) A proper Alien swarm would only be an annoying obstacle, like having a bunch of harmless moths and butterflies surrounding a human being. 4) Godzilla’s “Atomic Breath” isn’t his only attack plan (not counting his bash & smash). He also has a power that was called Nuclear Pulse, which sends atomic energy in all directions from his body, that comes from every inch of his skin. So what if a swarm manages to get on him? He can just turn them to atomic dust in one pulse! 6) Other than his bulky physique making him a lot less agile, his main, and primarily consistent, weakness is electricity by man-made means (as lightning has been shown to only further speed up his rapid regenerative abilities) and a lack of oxygen. And since he’s amphibious, the Aliens don’t really have a method to take away his oxygen. Godzilla has survived being in the magma chamber of a live volcano and being at ground zero of asteroid impacts. If it were the remake of Godzilla, the Aliens would win hands down, because that remake was a weak wussy. But the original would win hands down every time. And no matter what, humans lose, lol.